How do I set up a user to be able to do a Customer Search/Add a call on the device? How do I set up a Tech to be able to do a Add a Job from the device? By default, when the user groups for SWRemote are created in SuccessWare21 the groups named 'RemoteTechManager' and 'RemoteTechOnCall' both have this ability. *NOTE* If your tech is in the RemoteTech Usergroup and you wish to give them this permission, change them to the RemoteTechOnCall Usergroup. If you wish to give this permission to a non-Remote Tech usergroup, use the instructions below. Log into SuccessWare21 with administrative rights. 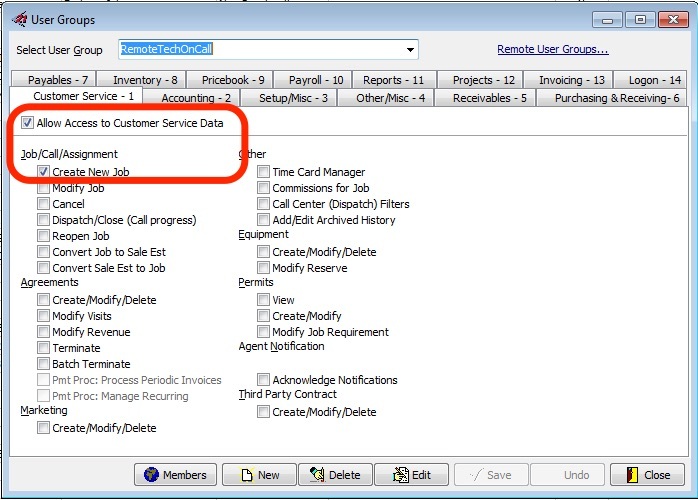 Check the box labeled 'Create New Job' - This will also check the box labeled Allow Access to Customer Service Data. The next time a technician logs in on a device who is a part of that group they will be able to do a Customer Search and create new jobs. The Customer Search button is available on the Main Menu. Click here to find out how to perform a customer search from a Device. edit the customer Location information. Add a job directly from the Device. Click HERE to learn how to Add a Job directly from a Device. ***Note: The Schedule Search and Add job functionality are tied together, you can't have one without the other.